A grieving Bay Area woman who lost her life partner to a stroke was able to hear his heartbeat again for the first time since his death. San Francisco firefighter Perry Choy gave the gift of life to a 63-year-old Oroville man with a successful heart transplant. 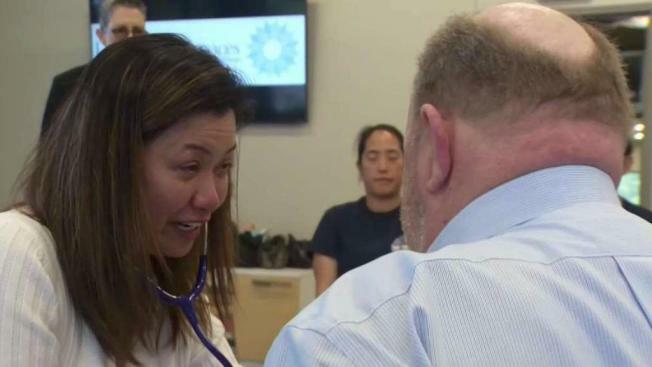 Tears streamed down Aletha Gomez's cheeks as she held a stethoscope to Jim Donvan's chest and heard her late partner's beating heart once again. "I felt so connected with him," Gomez said of Donovan. "Actually, after hearing his heart, it seems like he's family to me now. We're going to be family." Choy, a 20-year veteran of the fire department, died unexpectedly, just days before his 47th birthday. But his donated heart means a new chapter for Donovan, who told KCRA in Sacramento he promises to spend lots of time with his grandchildren. While Donovan's story has a happy ending, there are well over 100,000 people nationwide who are in critical need of an organ transplant. And of those, 21,753 are Californians. The organs include hearts, lungs, livers, kidneys and the pancreas. About 12,000 Americans died last year while waiting for a transplant or because they were too sick to receive one. Those who wish to become organ donors can do so easily through the Department of Motor Vehicles or online.